2 medium sweet potatoes, peeled and chopped. ½ tsp. freshly ground pepper. Pre-heat oven to 450o Place chopped sweet potatoes and onion on a baking sheet. Toss with 1 Tbsp. olive oil. Roast in the oven for 25 minutes or until potatoes are soft. 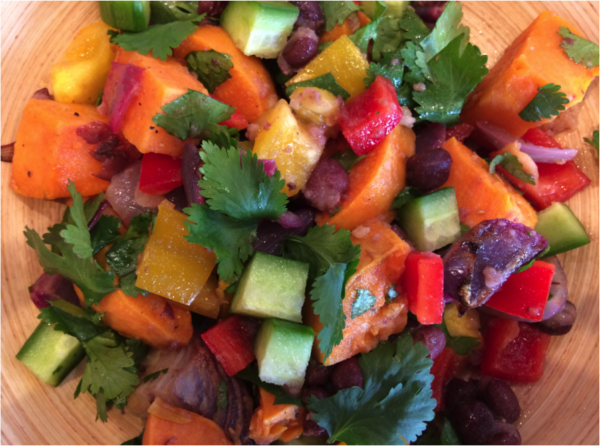 While the sweet potatoes are cooking, mix together the cilantro, beans, peppers, and cucumber (if using). Set aside. Add the cooked sweet potatoes and onion to the other ingredients and pour the dressing over it all. Mix well. Serve warm. Store any leftover in an airtight container in the fridge. The salad will keep for a few days.